Zeschuk also admitted that it will be an “interesting challenge” to compete with World of Warcraft, noting the MMORPG’s overall size in regards to its international reach and the yearly revenue it generates from subscribers and in-game purchases worldwide. BioWare’s apparent take on Star Wars: The Old Republic is to launch an established, stable realm in the market rather than unleash a Star Wars-based mammoth (Bantha) out to take down World of Warcraft and other MMOGs. “The audience will tell us if we have a place,” he said. Also present on the keynote panel was Blizzard’s Mike Morhaime. He told Zeschuk to “do a good job” with the Star Wars MMOG. His take is that The Old Republic may bring in MMOG “virgins”– those that previously never considered playing a subscription-based MMOG. 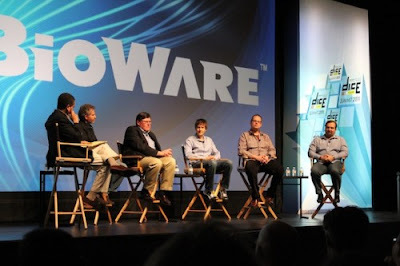 If those new players try BioWare’s epic and walk away discouraged because of bad gameplay or instability issues, they may not give the genre another try. Naturally if The Old Republic rocks and new players decide they’re newborn fans of MMOGs, Blizzard and other publishers/developers will likely reel in a new customer in the long run.